Support for the Australian government has crashed after a week of backstabbing saw Malcolm Turnbull deposed as prime minister, with a poll Monday showing it is on course to be hammered at elections due next year. 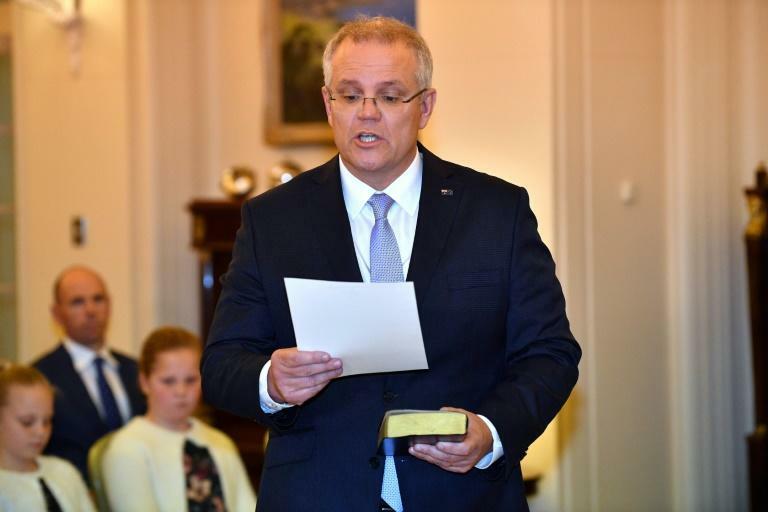 Scott Morrison was sworn in as the country's 30th leader late Friday after a bitter Liberal Party revolt against moderate Turnbull driven by a hardline conservative faction. The political blood-letting infuriated voters, with the first poll since the leadership coup to gauge the public response putting the Labor opposition ahead by 12 points, at 56 to 44 percent on a two-party basis. It was a massive change from Labor's narrow 51-49 advantage a fortnight ago. The survey of 1,783 voters for The Australian newspaper over the weekend also pointed to a large swing towards Labor leader Bill Shorten as preferred prime minister. Two weeks ago, Turnbull had a 12-point lead as best leader, but this has now swung to a six-point advantage for Shorten -- the first time since February 2015 he has been in front. The poll also showed that voters considered Julie Bishop, and not Morrison, to be right person to head the Liberal Party. The popular foreign minister has since resigned and moved to the backbench. Bishop was one of three people who threw their hat in the ring to succeed Turnbull, but she was eliminated in the first round of party voting. The man who instigated the coup to seize Turnbull's job, arch-conservative Peter Dutton, was backed by just six percent of those questioned. New Treasurer and deputy Liberal leader Josh Frydenberg, a Turnbull ally, conceded the disastrous poll put the government on track for a devastating defeat at elections that must be held by mid-May. But he said it was no surprise after the party spent a week ripping itself apart. "The polls today are the biggest surprise since the sun coming up tomorrow," he told 3AW commercial radio. "The last week was a very difficult week for the party and my colleagues but we do need to move on." Morrison has already announced a new cabinet -- including some of those behind Turnbull's toppling -- and is also keen to move on quickly, visiting drought-affected areas Monday after pinpointing farmers as his number-one priority.